If you need an expert tree surgeon, contact Essex Garden Care on 0800 043 3913 today and they will arrange for a skilled Arborist to attend to your overgrown tree. There’s nothing better than lounging in the shade of a healthy and vibrant tree whilst relaxing on your property. When well cared for and properly maintained to suit the size and area of your garden, trees can be a unique and attractive addition. However, all kinds of problems can arise when trees are left to their own devices. Trees can become sick and disease ridden or worse — unruly and dangerous for buildings, people and vehicles in the vicinity, leading to insurance issues. Insurance companies are thorough and will hold you responsible for any damage if they deem that it could have been avoided at an earlier stage. It pays to be aware of the species of tree in your garden as each tree species respond differently to surgery. If you think the trees on your property require surgery, notify a locally based tree surgeon in the south east of Essex about the species beforehand. 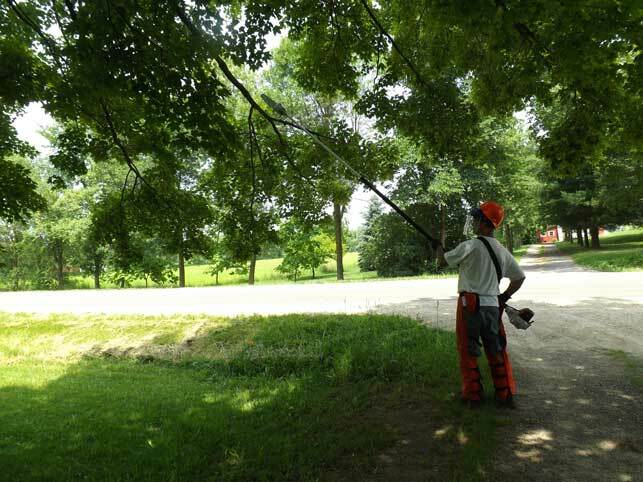 There are a variety of reasons for hiring local tree surgeons. Check the list below to see the options available to you. Over time trees can become beset by disease and die partially (branches) or completely. If your garden or property contains more than one tree, removing the diseased tree is necessary to prevent the spread of disease and of course keep your garden looking vibrant and beautiful. Sometimes branches can break or cross over and this can become a safety hazard should the branches snap off and fall. Tree climbers like ivy, clematis and honeysuckle can smother trees, cutting off the essential sunlight, competing for valuable nutrients and water in the soil. If your tree’s or trees’ branches are hanging low over a building or path, blocking access or views, a local tree surgeon can prune back branches and reduce the crown to open up the area. In some cases, growing trees can gradually destroy the walls within their vicinity. This may require the complete removal of the offending tree. Perhaps your fruit trees aren’t producing enough fruit. This requires the specialized skills of a locally based tree surgeon who is familiar with that type of tree species. Inevitably, when there is more than one tree in an area, as they grow, they may begin to compete for space. In this case a tree surgeon can either prune both trees or remove the weaker tree so that the stronger of the two can thrive. Large trees or patches of trees in a garden can create a gloomy effect, blocking out sunlight and views. Hire a professional to prune back your trees and open up the area so you can better enjoy your garden and expose it to more sunlight. If you find that the tree or trees on your property are sick or simply growing unruly, seek out a professional tree surgeon in your area. Don’t attempt to deal with the tree yourself. Hire an expert and save yourself and your property any further grief. A garden or property with healthy and vibrant trees is a joy to behold. Call Essex Garden Care on 0800 043 3913 today for more information about removing your tree and keeping the shadows out of your garden.